Crest has been the leading brand of Toothbrushes for over 45 years. Their products are recognized by the American Dental Association, who claims that Crest's products effectively prevents tooth decay. Over the years, Crest has continued to make advancements in their products to ensure customer satisfaction. Crest's newest toothbrushes have expanded their children's line, while improving the Oral-B line. For children, Crest offers several toothbrushes with different television characters on them to keep kids entertained while brushing their teeth. Crest's Oral-B line for adults offers a Cross Action Pro-Health toothbrush, which has bristles to not only clean teeth and gums, but your tongue too. This allows for deep cleaning of the entire mouth, not just your teeth. The Oral-B Pulsar Pro-Health toothbrush also cleans teeth and gums, but features soft Micropulse bristles that vibrate in between teeth and break up plaque build up. Although this toothbrush has a vibrating movement, it is not really considered an Electric Toothbrush like the other Oral-B rechargeable electronic toothbrushes offered by Crest. The Children's Toothbrushes cost about $2.99. The Cross Action Pro-Health Toothbrush runs about $3.99, while the Oral-B Pulsar Pro-Health Toothbrush sells for about $11.99. 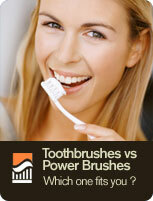 For the prices, these toothbrushes are a great alternative if the Electric Toothbrushes are out of your price range.